Whether you are on the go or just in the mood for something quick, a smoothie can be an easy addition to your day. Smoothies are great because you can have them for any meal or snack throughout the day and you can mix a match so many different ingredients for a wide variety of flavor combinations. While these two processes both provide nutrition, they are very different in terms of the fin al product. Juicing is a process where the liquid from the fruit or vegetable is separated from the fiber. This liquid consists of vitamins and mineral, and is much more condensed in both these as well as carbohydrate and calories than a whole piece of fruit or veggie would be. Juices are very nutrient dense and the volume of the drink will be much less than a blended smoothie drink. You also need more fruits and vegetables to create a juice than a smoothie, which increases the overall caloric content of the liquid. Juices can be great for those individuals who need a very high calorie or low fiber diet. In general, whole fruits and veggies are a better alternative to juices because you get the added benefit of dietary fiber and an increase in satiety from the volume of the food you’re eating. 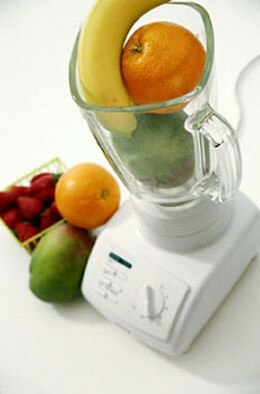 A smoothie uses the whole fruit and vegetable, including the dietary fiber, in a blended form. Because of the benefit of the added fiber, smoothies typically have a higher feeling of satiety (or fullness) than a juice and improve digestive health. With smoothies, you have the ability to add in vegetables, nut butters, nuts, seeds, protein powders, etc. All of these “extras” will increase your intake of protein, healthy fats and create a thicker, more satisfying smoothie. Smoothies are also great vehicles to add vitamins and minerals to you and your kid’s daily intake. Added sugars, low protein, and high calorie intake is a common theme when ordering a smoothie out. Ask if they add any sweeteners (honey, agave, maple syrup, brown sugar, molasses, and more), and ask the server to leave that out of yours. Smoothies are typically sweet enough with the natural fruit sugar! The American Heart Association recommends no more that 25g of added sugar daily for women less than 36g daily for men. Remember, fruit contains natural sugar which is not included in the above numbers. When making a smoothie at home, make sure to add protein of any kind. This can include yogurt, protein powder, dairy or soy milk, or edamame. A common misconception is that nuts are a significant source of protein. While they can absolutely contribute to your total protein intake, they contain more healthy fat than protein. Finally, know your goals. It is really easy to make a smoothie with 800-1000 calories in 20 ounces of liquid. If liquids don’t satisfy you as long as whole foods (and for most people, this is the case), this may not be your best option for weight or fat loss. However, if you are trying to gain weight, build muscle, or get a recovery meal into your body when you don’t feel like eating (i.e. after an intense workout), a smoothie can be a quick, easy, nourishing option to satisfy your needs.